Today's my 35th birthday. There's a famous quote about your parents ruining the first half of your life and your children ruining the second half. That's how I know I'll live beyond age 70. No kids yet, and my parents are still making bold attempts to ruin my life. Don't believe me? Just ask Sonia. She doesn't exaggerate like I've been known to on occasion. Another reason I know I'll live past 70 is my phone number. You might think it strange, but when I was arbitrarily assigned my current cell phone number some 10 years ago, it struck me that the last four digits of it would be the year of my departure from this earth. 2060. When I was younger, I used to tell people that I was going to die when I was 60. But after I saw my phone number, I realized I had been mistaken. I'm not going to die at the age of 60. I'm going to die in the year 2060. So with that revelation, I began eating somewhat more healthily since I realized I had to account for an extra 21 years or so. That's one of the factors that led me to shop at places like Trader Joe's. Now there are those of you who will pipe up and say "But, but, but...Trader Joe's is just organic junkfood!" Maybe you'd be right. I don't know. But I currently believe it to be slightly healthier than most mainstream grocery stores like Ralph's or Giant. And remember, I'm aiming for 81. Not 91 or 101. I don't need to be that healthy. 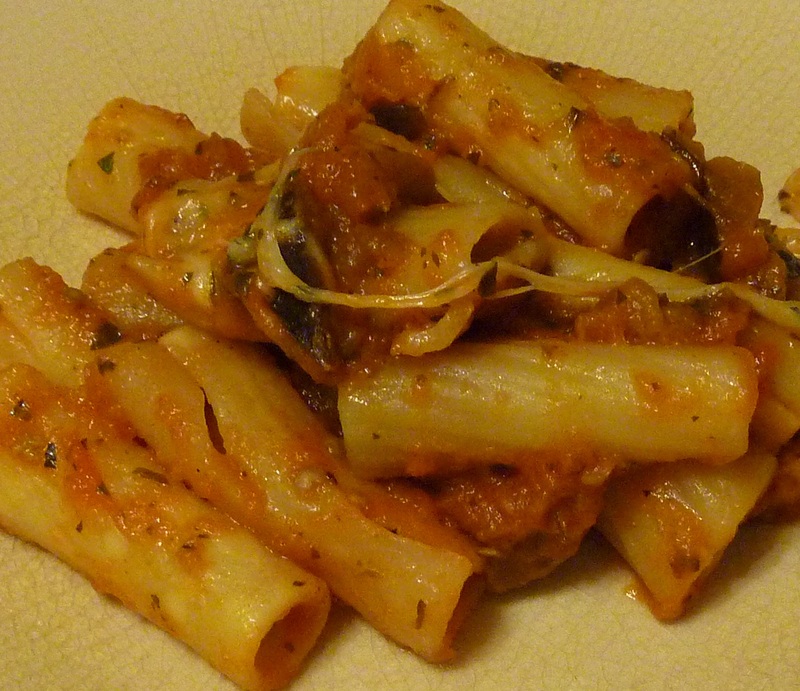 Pasta with eggplant sauce will suit me just fine over pasta with beef and pork or whatever. Don't get me wrong, I still eat meat. I just mix up my dead animal with eggplant from time to time. And eggplant's tasty. Usually. I'm down with stuff like baba ghanoush and Indian eggplant curry. This product was no exception. And even though the texture of eggplant is always a gamble, in this case it was pretty nice. Not rubbery. Not too chewy. I think our biggest complaint is that this dish was lacking a special zing. It wasn't super bland. You could taste pasta and tomato sauce and eggplant, and it was slightly savory. But with three and a half decades of memories to compete with, this product just ain't gonna stand the test of time. It's certainly not bad. If you're jonesin' for some eggplant, by all means, check it out. But both Sonia and I wanted a little something extra. Some magical spice harvested from the moons of Jupiter that makes eggplant taste like ostrich meat or something like that—that's what we were looking for and it just wasn't there. This dish was super not bad and super not memorable. 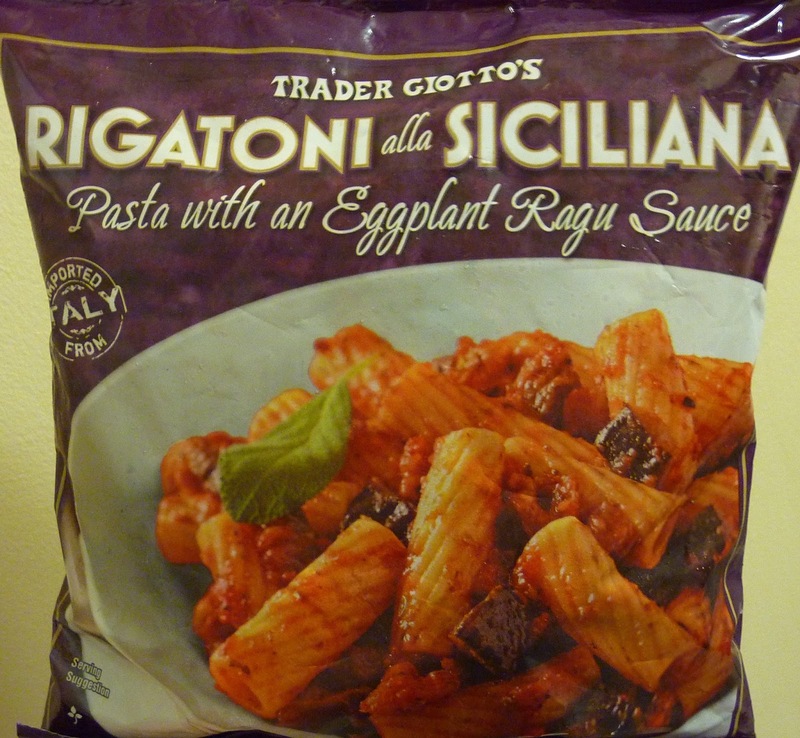 When I'm 70 and my kids are busy ruining my life, this bag of rigatoni will have been forgotten many decades prior. 3 stars from both of us. Happy birthday! Thanks for taking the time to so the blog. You always make me laugh and brighten the day. Love the tips of new things to try. Glad your voice is out the in the world for all to enjoy. Your wife and parents are lucky to have you! Have a happy year! What..is wrong with you?? LOL! This is my absolute favorite thing from TJ's ever. EVERRR!!!! I agree the eggplant texture could be better but the sauce! Omg. When I tore open my first bag of this stuff, it smelled like fresh basil. Sooo yummy. And the pasta is perfectly al dente! Mmm. Also I do like to add a splash of red wine to mine while it's simmering in the skillet and a splash of Frantoia olive oil. Winning. In my opinion anyway! I hope they never discontinue it! And also this sauce tastes like a perfect dupe of a local (really overpriced) restaurant's sauce, that I love. So yeah.